As the morning Sun warms the desert ground, columns of hot air begin to rise. When such a column encounters winds blowing in different directions at different altitudes, it starts to spin, feeding on hot air as it whirls across the desert, revealing its presence as it inhales sand. 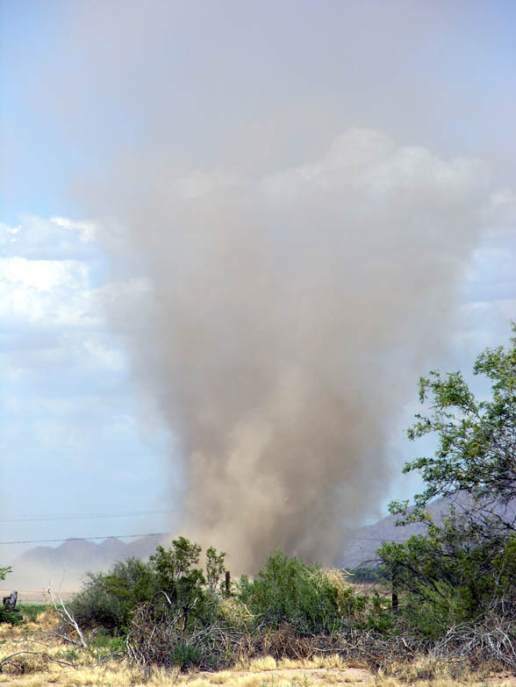 Its typical 40 km/h winds (25 miles/h) are mild compared to a tornado, but a dust devil too can be an imposing sight, with a whirling column of sand 30 m across and about 1 km high (100 feet wide and a half-mile high). The whirlwind in this picture has a less outspoken funnel shape than the one in the previous shot. It was captured on camera during the same expedition, one day later, on June 11.